All of the books about achieving your goals (running or otherwise) say that formalising, writing down, and telling people about them make you much more likely to succeed. 2017 was a pretty good year, running-wise (and my nine most liked instagram photos were all running related). I set PBs at 10k (40:35), half marathon (90:19) and marathon (3:31:19) distances, and ran my fastest ever 5k (19:25), albeit not on an officially measured course. I’m hoping aiming to make 2018 even better (it’s certainly going to be more expensive, with 3 overseas races but at time of writing these have all been paid for). I have, as all of the books recommend, set myself A, B and C goals and organised my training around these. 22nd April 2018 – London Marathon. I set a big PB in 2017 despite hot conditions and this year I am aiming even higher and training to go sub 3 hrs 20. 16th September 2018 – Berlin Marathon. If London goes well (and even if it doesn’t, so long as I don’t injure myself in training) I am going to train and aim for a sub 3 hr 15 marathon, the championship time for London. In the past I have increased speed over the summer when taking in more rays, so expect this to be true again. Berlin is also notorious as a PB course unlike London with its crowded streets. 4th March 2018 – London Big Half Marathon. I didn’t quite manage to get my sub-90 last year, so I’m going to have one more go at the London Big Half as part of my London marathon prep. I am sure that there will be other half marathons scattered throughout the year (indeed one of them is one of my C races) but this will be the first targeted attempt at the sub-90. 7th October 2018 – Chicago marathon. This comes just 3 weeks after Berlin so I won’t be racing it as such, but it is an Abbott World Marathon Major so just attempting to complete it marks it down as a B race. It will be great to see how the city has changed since I was last there in 2003 and if I come out of Berlin OK I think I might be able to manage around 4 hours (but really the aim is just to finish, as a victory lap for the year). 11th March 2018 – Lisbon Half Marathon. This is a week after the London Big Half, but was booked in beforehand and is a bit of a jolly with some other Bristol runners. Now that I have set the previous week’s half as a B race this will likely be more of a training run, but it will be my first overseas race. The remaining Weston Prom 5 mile races. I should be able to keep these fairly competitive as marathon tempo runs (with warm ups and cool downs) within my marathon training, to help out with whichever club team I am on (I think it is ‘Bristol & West South Westerlies’). I would also like to set new 10k and 5k PBs but have not factored them into my existing plans (I get a week or so off after London before starting training again for Berlin) so they will have to be as a consequence of my marathon training if they come rather than anything specifically tailored towards those distances. As such I have not booked any races of this length into my diary yet. I am sure more races will be added during the year (such as the Bristol & West 5k series and the GWR 10k series) but I won’t be adding any more A races, two marathons in a year is plenty to focus on. This entry was posted in running and tagged 2018runninggoals, berlinmarathon2018, chicagomarathon2018, marathon, running, thisgirlruns, ukrunchat, vmlm2018, vmlm2018training on 7 January 2018 by fak. The London Marathon was finally here, after a lot of training, and the forecast was for cloud cover and middling temperatures (12-14ºC). After the train journey and walk to the green start (which was a fair hike up a not inconsequential hill) it was clear that it wasn’t going to stay that way and it was time to crack the sunglasses out. After dropping the bags at the lorry Jane and I stood in a queue for the portaloos which took up all of the time before it was necessary to get into the start pens. The 3:30 pacer was in a pen ahead of me, so I took note of the time I crossed the start line (3 minutes 10 seconds after the start) and headed off. Given that the pens are supposed to be divided up by expected pace I was surprised at home many runners appeared to have zero spatial awareness (something that became a recurring theme over the race) and I was cut up left right and centre. In a way this was good because it prevented me going off too fast, but it was using up energy having to stop and start and go for gaps when then came up. Before hardly any time at all we merged with the blue start where the road was a little wider but it was still hard to get any space to run into. At around 3 miles we joined up with the red a start and hit the first water station, with more carnage as people veered steeply across other runners to get to the water (again a feature throughout the race). I was happy with my pace through the first 24km or so, it was putting me nicely on target for sub 3:30, but the sun was getting hotter and as we entered the Isle of Dogs the screaming from the supporters was echoing off the buildings and making me feel quite ill. It didn’t help that I seemed to be keeping pace with a Guinness World Record attempt of a two-man Jamaican bobsled, which was attracting a lot of attention. The buildings there meant that you couldn’t trust your GPS to give a true reading of your pace, and I dropped off a little as I went through the toughest miles in terms of there not being much to look at and it being too far out to really start counting down to the finish. I started to struggle to take on any gels, managing a mouthful but not being able to stomach the rest in the heat, but took on water at every station (and still ended up with great salty deposits from how much I was sweating, you do not want to know the colour of my pee when I finished). There were some nasty inclines and hairpins to get you back headed in the right direction and as I hit the embankment I knew it was going to be close as to whether I would get sub 3:30. I would need to pick up to my planned marathon pace. I gave it all I had, but when I went through 25 miles I knew it would be a stretch. When the 1km to go marker came I knew it was over, but still pushed on to finish as well as I could. My official provisional time was 3:31:19, which is still a massive PB and good-for-age for next year. Apparently it put me in 6549th overall, 918th lady, and 562nd in my age category. Thank you to everyone who sent message of support, or who supported me through my training, as well as those who came along to cheer (sorry I didn’t spot you Sam). This entry was posted in Uncategorized and tagged bigmarathonchallenge, running, ukrunchat, vmlm on 23 April 2017 by fak. A final jog out before the big one tomorrow, after a bit of a hike out to Mile End (we were all following Alison who thought someone would yell if she was going the wrong way, we all assumed she knew the way), a rather crowded bit of parkrun tourism. Last week they had under 200 runners, this week they had over 400. I managed to sneak in to get one of the final proper position tokens in 246 having taken it reasonably steady (the downhill’s were fun). Bronze: 3:44:59 – this would be qualification for London next year as good for age for my age category. Silver: 3:40:20 – this would be a new marathon pb (my previous time being 3:40:21). Gold: 3:29:59 – I’ve been training to go sub 3:30, so anything under that pace would be great. If I feel good and have the opportunity to push on towards the end of the race then I will, but realistically you can’t make up too much time over the last 5-6 miles and I’m more likely to be working on holding to pace than be able to increase it. It should be fun, I’m nervous obviously (a marathon is always a huge challenge), but excited more than nervous and I have done all of the preparation asked of me. What happens on the day happens (good or bad). For anyone wanting to track me, I am number 30917. This entry was posted in Uncategorized and tagged bigmarathonchallenge, parkrun, running, ukrunchat, vmlm on 22 April 2017 by fak. My final run in Bristol as I head off for London tomorrow morning. Just a gentle 30 minutes to keep the legs ticking over. I picked the flatest bit of Bristol I know (apart from the getting there and back), the track alongside the river Avon (not in it as the GPS suggests). Remarkably low on the duck count this morning, but high on the bluebell front. Not long now. This entry was posted in Uncategorized and tagged bigmarathonchallenge, running, ukrunchat, vmlm on 20 April 2017 by fak. The final long run a week out from the big one and a last chance to test out all of the kit, including eating what I intend to and starting at about the same time. This was just 50 minutes of marathon pace after a quick 10 minute warm up and followed by a 10 minute cool down. It was just enough time to squeeze in the 10k version of the Zombies, Run! spring race, which was confused by Staple Hill tunnel again, but which awarded me a time of 48:13 for the race portion of the mission. I also managed to finish off the rest of the 5k mission (the race part was already over), so I can open up my goodies now and hang my medal. Trying not to think about next week too much now, I have put the training in but don’t want to get over anxious or over excited before I cross that start line and see what I can do. Fingers crossed the weather holds much as it has been today, not too hot. This entry was posted in bigmarathonchallenge, running and tagged bigmarathonchallenge, running, ukrunchat, vmlm, zombies on 16 April 2017 by fak. Sleep-deprivation mounted up over the week of the BJC, but after reuniting with the kittens and unloading the car I still had a threshold interval session to do so I headed out to the good old railway path which has been much neglected while I have been away. The zombies, run! Spring virtual race was also live so I decided to start the 5k race after my warm up. Today’s session was 6 reps of 5 minutes at threshold (heart rate zone 4) with 60 seconds recovery. The first rep was a bit ropey as my legs seemed somewhat uncoordinated, but I soon warmed up into the session and my pace improved going from 4:40 min/km to 4:30, 4:25, 4:31, 4:24 finishing with 4:20. The Zombies, run! app always gets confused when I go through the Staple Hill tunnel so I actually ran further than 5km to finish the 5km race, but was given a race time of 23:47 (though I stopped the mission at 30:12, after I was instructed to stop running). I’ll try and do the 10k race on Sunday in my final bit of marathon pace before London. This entry was posted in bigmarathonchallenge, running and tagged bigmarathonchallenge, running, ukrunchat, vmlm, zombies on 13 April 2017 by fak. I had a day off yesterday, though this being a juggling convention I was considerably more active than I would be on a normal rest day (I even attended two workshops, which is virtually unheard of). This morning I managed to have a lie-in, and when I did emerge in my running gear I attracted the attention of my tent neighbour, friend and fellow runner Paul. Since I was only going out for a recovery run he decided to join me and it was lovely to have some company for a change. We had a lovely bimble round a little nature reserve, comparing innacurate wrist heart rate readings. This entry was posted in bigmarathonchallenge, running and tagged bigmarathonchallenge, running, ukrunchat, vmlm on 11 April 2017 by fak. Marathon training stops for nothing. Even though I am away at a festival, which means I am eating too much crap whilst not getting enough sleep or drinking enough water, I still had a marathon paced effort to do. The weather was not my friend. I have a highly efficient cooling system (aka I sweat a lot) so hot and sunny weather is pretty much my worst nightmare and why I spent the last three miles of my first marathon feeling like I was going to throw up every step I took. I usually make sure I take on water every 10 minutes on my long run, but today under a cloudless blue sky I drank every time my brain thought ‘water’ which was closer to every 5 minutes. Having plotted my route on google maps there were a couple of wrong turns as I made my way to and then round Wollaton Park, but I managed to maintain my marathon pace for the full 90 minutes and was grateful for the many trees along the route offering shade. I can only hope it’s not as hot in London. This entry was posted in bigmarathonchallenge, running and tagged bigmarathonchallenge, longrun, running, ukrunchat, vmlm on 9 April 2017 by fak. A spot of parkrun tourism at the BJC, though we very nearly didn’t make it as the gate that was supposed to allow 24-hour access was locked and we luckily found an alternate route out to make it just in the nick of time. If there was any important information in the briefing we didn’t hear it, not because we were late, but because the megaphone was feeble. A lovely little two lap course that went around a series of football pitches then up into a wooded area. I spent the time chatting to Polly with a little sprint at the end. Back on site I squirelled myself away in a squash court with my yoga mat to get some core work done. At one point the staff came in to make the court bigger, but they didn’t seem to mind me so I just let them get on with it without interrupting my workout. Long run tomorrow, I think I have my route planned out. 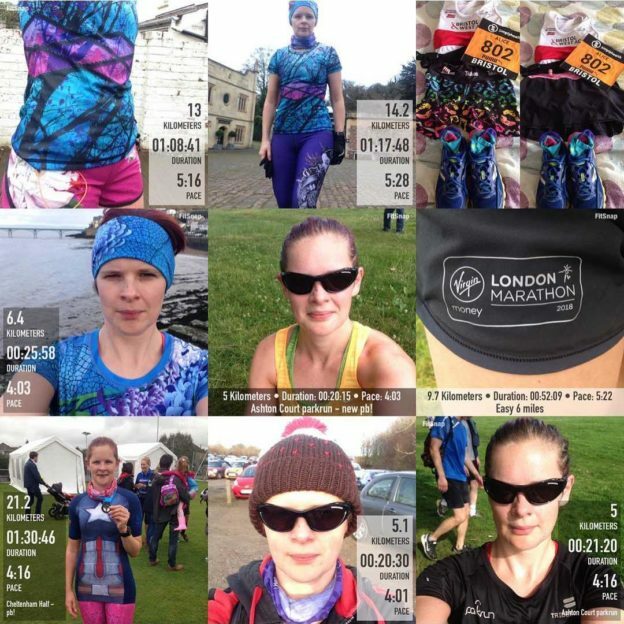 This entry was posted in bigmarathonchallenge, running and tagged bigmarathonchallenge, parkrun, running, ukrunchat, vmlm on 8 April 2017 by fak.